Who are the Denver Broncos going to start at quarterback? The Denver Broncos have a new head coach and after a rough 2016 season, they’re looking to start fresh. The Denver Broncos weren’t the same without Peyton Manning in 2016. Granted, Manning was mostly awful in his final year, but he was good enough in the postseason to hoist the Lombardi. Now? The team doesn’t have the same feel to it, ya feel? Last year, the offense never clicked, especially the passing game. The defensive line was not great considering they gave up an average of 135.2 rushing yards per game, but the secondary, per usual, was stout. Even their 9-7 record was “meh,” though it was a winning record. As a whole, the Broncos were awkward to watch. The only plausible explanation is this: the Broncos lack leadership. After Manning’s departure, the Broncos not only needed a new starting quarterback but a new leader as well. The Broncos need on-field leadership, and they can find that through their two, potential, starting quarterbacks: Trevor Siemian and Paxton Lynch. Siemian was drafted in the seventh round of the 2015 NFL draft. He was never supposed to be a starting quarterback, and yet he started 14 games last season. Technically speaking, Siemian was a starting quarterback, but he’s ideally suited to play the role of backup. This is evident through his mediocre numbers from 2016, where he threw for 18 touchdowns and 10 interceptions. Also, Siemian’s QBR was 55.8. His statistics do not scream starter. Lynch was the 26th-overall pick in the 2016 NFL draft, and he was supposed to be the steal of the draft. The Broncos even traded up in the draft to snag him. He’s supposed to be the heir apparent to Manning, but that hasn’t materialized yet. The Memphis product is still young but entering his second year, needs to make strides. With new coach Vance Joseph at the helm, Lynch and Siemian are on an even playing field. No one has the edge over the other. All in all, this is great for Lynch. 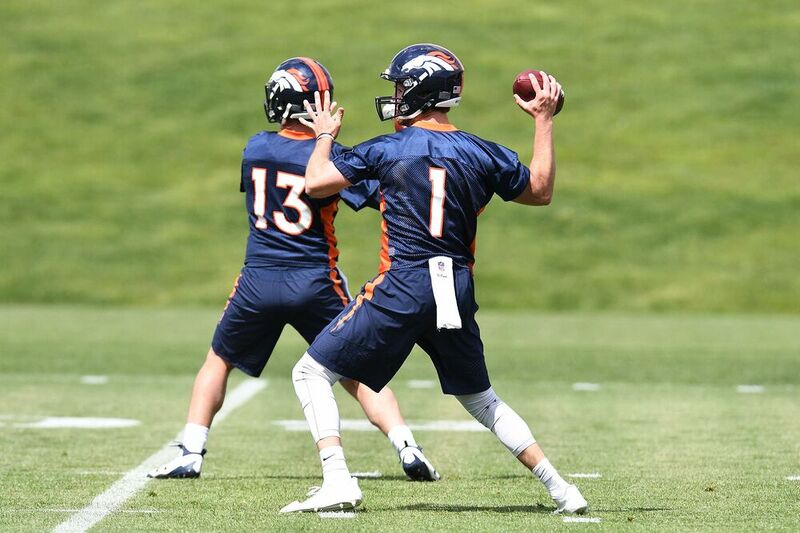 Siemian already illustrated to everyone what he is capable of doing on the field. Lynch is the great unknown, which in this case should help considering the draft capital used to acquire him, along with Siemian’s limitations. However, according to Ryan Broaddus from DallasCowboys.com, Denver is having issues with Lynch’s work ethic. Here is a quote from SportsNaut.com. Whether this report is accurate is anybody’s guess, but it remains a talking point. If Lynch isn’t working to the best of his ability, it puts Joseph in an easy position. Give the job to Siemian and send the youngster a stern message. Another report on May 24 about Lynch was also unfavorable. If you’re a young quarterback attempting to prove to your new coach that you deserve the starting job, wouldn’t it be smart to stick around the practice a little longer to work on your game? The Broncos have a tough decision to make. Both quarterbacks are young, but possess wildly different skill sets. Lynch has the higher ceiling, from Siemian appears to enjoy a higher floor. Whoever Denver picks, it will need a good supporting cast. The Broncos have yet to prove that they have a sufficient starting line to protect their future quarterback and an above average defensive line to stop opponents from running. One thing is clear; Joseph has his work cut out for him.